We have a new cross-browser compatible, customizable, professional joomla template with 9 module positions, 5 color schemes: black, blue, green, purple, and aqua, tableless portal layout, dropdown menu and minimalist design. A free version of this joomla template is also available in blue color. 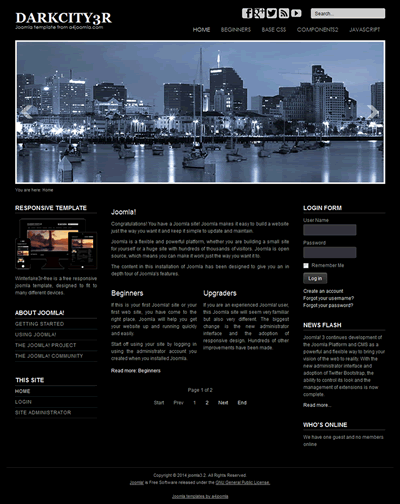 The commercial a4joomla-Minimal-Art joomla 1.5 template can be purchased here. a4joomla-Light is a new cross-browser compatible, customizable, professional joomla template with 9 module positions, 7 color schemes: black, grey, blue, light blue, purple, light purple and aqua, tableless portal or blog layout and dropdown menu. 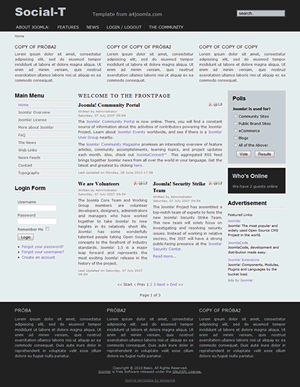 A free version of this joomla template is also available in grey color. The commercial a4joomla-Light joomla 1.5 template can be purchased here. a4joomla-Social-T is a new cross-browser compatible, customizable, professional joomla template with 10 module positions, 4 color schemes: blue, purple, aqua and grey, 3 module styles, tableless portal or blog layout and dropdown menu. 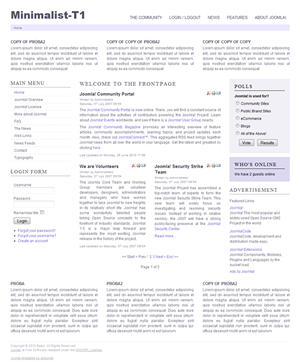 A free version of this joomla template is also available in purple color. 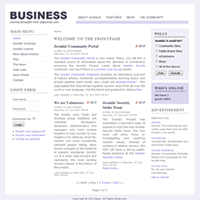 The commercial a4joomla-Social-T joomla 1.5 template can be purchased here. 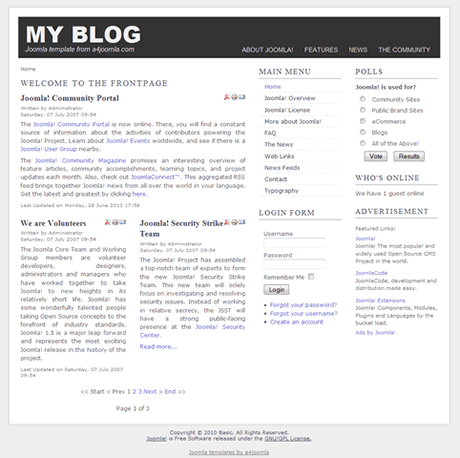 a4joomla-Blog-template-free is a new cross-browser compatible, free joomla template with blog layout and minimalist design. The template can be downloaded here. a4joomla-Minimalist-T1 is a new cross-browser compatible, customizable, professional joomla template with minimalist design, 9 module positions, 5 color schemes: blue, green, purple, aqua and grey, 3 module styles, tableless portal or blog layout and dropdown menu. 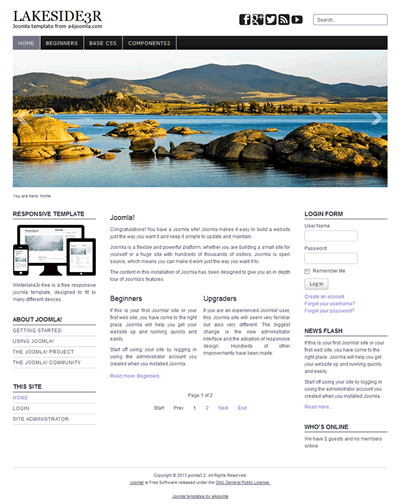 A free version of this joomla template is also available. 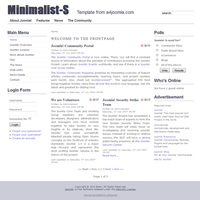 The commercial a4joomla-Minimalist-T1 joomla 1.5 template can be purchased here. The demo of this minimalist joomla template can be found here. a4joomla-eBusiness is a new cross-browser compatible, customizable, professional joomla template with clean design, 11 module positions, 5 color schemes: blue, green, purple, aqua and yellow, 3 module styles, tableless portal or blog layout and dropdown menu. It can be used not only for e-Business, but any other websites. The commercial a4joomla-eBusiness joomla 1.5 template can be purchased here. The demo of this e-Business joomla template can be found here. 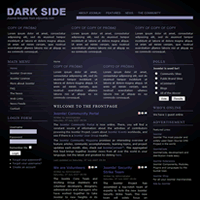 The free version of the a4joomla-Darkside joomla template can be downloaded here. 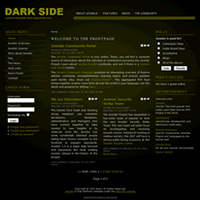 The commercial a4joomla-Darkside template can be purchased here. 3 module styles in the pro version. 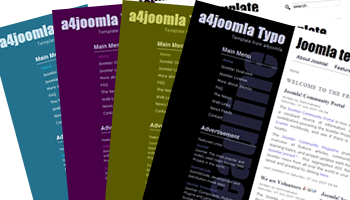 The free version of the a4joomla-Business joomla template can be downloaded here. We have a new commercial joomla 1.5 template with nice typography and 9 color schemes. It's cross-browser compatible, has tableless layout, customizable header, dropdown menu. The background image with the vertical text is editable, but we can also edit it for you. See the demo with a user's guide here, or buy this joomla template here. 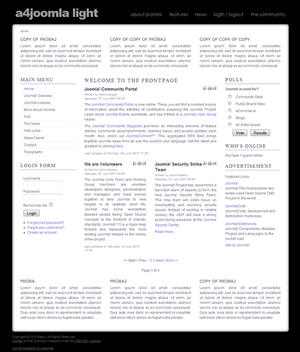 A new version (1.1) of the free and the pro a4joomla-social joomla 1.5 template was released today. The main improvement is a new module position (top) that makes it possible to have a horizontal menu in the top right corner, e.g. for Login/Logout and Register menu items. There is also a new color style for these joomla templates, which is now the color of the free template. If you have an earlier version, follow the installation instructions written in the previous post. To download the free template click here, or buy the pro version here. 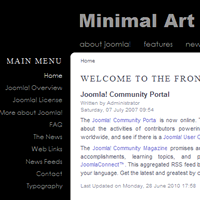 We have a new free joomla 1.5 template with minimalist design. It's cross-browser compatible, contains tableless layout, collapsible modules, customizable pagewidth and sidebar widths. You can set a text or graphic logo, and a slogan. Claim it for free here! We have a new joomla 1.5 template quick reference guide, which contains most of the joomla 1.5 CSS ids and classes, some info about the index.php and module chrome. You can identify which HTML tags are affected by the joomla CSS classes and ids, and we also give some explanation when needed. It is classified in a way that makes it easier to overview the topic. This joomla template quick reference guide is freely available, but you have to sign up here.